The "Admissions team" (aka ADCOM) started preparation one month before the actual process began. In addition the one un-breakable rule "Everything should be done in parallel with the hectic study schedule" made their days very difficult. Completing the classes, assignments, case analysis by evening, they continued with the pre-process work in the later part of the day. They started with assigning buddies for the applicants, doubt clarification and continued until the applicants completed their interview. If you have guessed it right, I am talking about the efforts of "Admission team" in smooth completion of the admission process of our college. I take pride in saying; most of the events in our college are student driven. And this is one of the biggest events that are student driven, but of course with the support of professors. In the process what do the students get? Why are they doing it? To state a few facts - the admission process takes place for four days. About 800 students attend the process. The number of students involved in helping the process apart from the admission team is 80 students per day. So you can understand the quantum of effort that goes to make it successful. 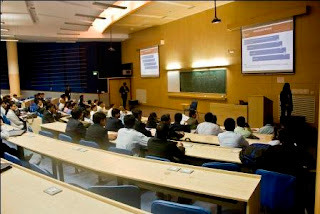 The students form teams for successful execution of the process. The students are involved in the process from 7:45 am till 9:00 pm. They assume different roles as Transit coordinators, Panel coordinators, Registration coordinators, Verification and Query Resolution coordinators. One can find all of them busy in making the process as smooth as possible and most importantly on schedule. Students are guided from the SJMSOM building to the admission process location (which is in same campus but in a different building). 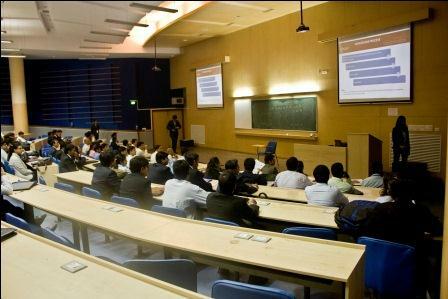 As soon as they reach, they are given a brief presentation on the college, which is followed by WAT (written aptitude test), parallel Verification, and an interview. To answer my previous question, this is why management students do it - MBA is not a subject that can be understood inside the walls of the room. Students go out of their way to learn team work and understand the intricacies of the process. After these 4 days, the happiness we get is not quantifiable; the satisfaction of success, the accolades from professors for successful admission process brings confidence in the students which are unmatched with any of the theory we learn in classrooms. cách làm kem dưỡng da từ lô hộiNhư chúng ta đã biết thì chanh là một nguyên liệu có khả năng làm đẹp rất tuyệt vời. cách làm kem dưỡng da từ nghệKiên trì làm và đắp mặt nạ củ đậu thường xuyên sẽ cải thiện làn da ngả màu của bạn một cách an toàn và hiệu quả. cách làm kem dưỡng da bằng nha đamBạn cần chọn những củ đậu tươi và không bị phao, vì loại đậu này có nhiều nước rất tốt đối với việc chăm sóc da. good confirm that your PC's graphics as well as motorists are fully Play Store for PC which is offered on APK Mirror the most convenient way to mount nice. When I visit website it's like a very best visit of my life in any site. This site just open my eyes. I really fell now very relax. Thanks for share this topic. I will suggest my friend to visit this site also. SJMSOM university had the admission time here and it could be a chance for the student who are in love with this university. http://www.nephrologyfellowship.com/about-our-nephrology-personal-statement-writers/ you'll be find some helpful information about the academic writing service. It would be the possibility with the scholar who definitely are excited about that college or university. You can be uncover many helpful link information around the academics publishing services. Very good data to find out along with appropriate concise. Cheers just for this well crafted article, i’ll check website in pertaining to additional changes in case you preserve putting up these people.